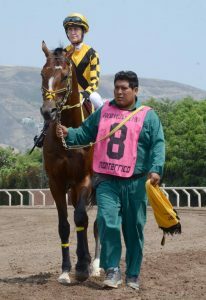 Serena Brotherton enjoys success in Peru! Whilst most of us have been coping with The Beast from the East and Storm Emma for the past few days and deprived of racing here, its good to see some of our amateur jockeys enjoying race riding in warmer climes! 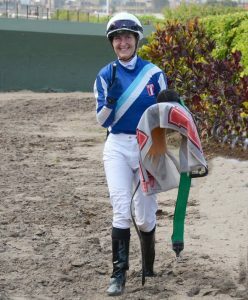 Our winning most lady champion Serena Brotherton enjoyed representing the UK by becoming our first amateur jockey to ride in South America when riding in Hipodromo de Monterrico, Lima, Peru on 24th February. Her first ride was unplaced but her second ride THUNDERING SAINT finished 3rd from a wide draw stepping up from 5f to a mile. It was an exciting finish! 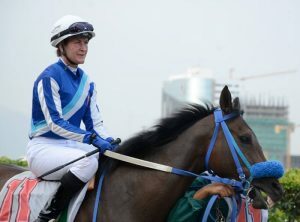 Serena is the first UK amateur jockey to ride in South America and only the second English jockey to ride in Peru ever, with Lester Piggott being the first and he also finished third! Well done Serena! Huge thanks to our friends Jochi Meza and Sara Torre for their fantastic hospitality and kindness in making this extraordinary experience possible.